Circus Tent - הירשל ציג'ס בלאג: Hijacked By Lubavitch! tell me, people: a man who had no children and who was a Rav in faraway Brighton Beach, who should MC the levaya?! some guy who had zero connection to him, just so you guys will feel happy? ask any litvishe bachur if they ever heard of the man before! ask any Satmarer if they ever heard of him! then ask a Lubavitcher and see what you hear! so please, let's not get all childish here. Rabbi Hollander's father learned in Pressburg, he was a talmid of R. Akiva Sofer. His son was quite knowledgable in the intricacies and subgroups of the frum world and navigated them skillfully, so much so, that he became like Esther hamalka, different groups saw him as one of their own. He was a European, but spoke English so well that he seemed American. He went to Torah Vodaas but went to RIETS as well. He wrote for the Forverts as well as the Algemeiner, wrote for the Jewish Press, but was the subject of very positive feature in the Yoseid. Not only was he a talented writer in both English and Yiddish, he was also a powerful orator in both tongues. Lubavitchers saw him as a quasi-Lubavitcher, Satmar saw him as a mekurav to Satmar, the Yeshivish Lakewood types saw him as one of them due to his work advocating the psak of R. Aharon re mixed organizations, Modern Orthodox saw him as one of their own, he was a past President of RCA, but then he also was present of Igud, and the director of Agudas Harabbonim was maspid. He was recently featured in OU magazine, as well as in Hamodia magazine. Hungarians saw him as Hungarian, others thought he was Litvish. His signature issue was the separation from Conservative and Reform. He was so involved in that that maybe he didn't see the need to separate from Lubavitch al pi hadrochas ��� ���"� �� � �������"� ��"�. Maybe he didn't know Rav Shach, we can be melamed zechus, he was already older and not traveling so much then, so it was not like when he was younger and visited the Brisker Rav. But, sof kol sof, it was a taus (nebech a taus iz aych a taus, to paraphrase R Chaim Brisker's famous words re apikorsim), so he got the 'kovod', biloshon sagi nohor, of having his aron passing by 770. The bizoyon he had to endure before kevura should be a kapporo and if other people see and take a lesson it could even be a zechus for him. Yeruchem is wrong, he was known to others, most people who attended were not Lubavitch, the Yoseid featured him prominently a while ago and the feature was enthusiastically received. Yes, he admired some things in Lubavitch, but that doesn't make him a Lubavitcher. Anyway, since when does a non-Lubavitcher aron pass by 770 deliberately, it sounds pretty rare to me, if not-unprecedented. Tzigele, you a different font if your going to write Yiddish in italics - this one is hard on the eyes. I'm really surprised by idiots that come here. Was Rabbi Hollander a Lubavitcher? No. Did he work with many groups? Yes . . . However, let us not forget that the Hebrew Alliance worked very closely with F.R.E.E. -a Chabad organization that deals with immigrants from the FSU. Are any of the morons here so sure that he was against his aron passing 770? I have no knowledge one way or another, but I am not a fool to assume one way or the other. What I do know is that his wife, B"H, is still alive . . . I had a chance to speak to her briefly yesterday, and got the sense that she wouldn't let a bizoyen happen to her husband z"l.
I have very fond memories of Rabbi Hollander going back many years.When I was a bochur in 770 he would come in once a week to teach us how to write and present a speach.We had to take a bus every Wed. night to Bedford and Dean where these lessons would take place. Even in those years he exhibited and expressed a strong hiskahrus to the Rebbe and Lubavitch, notwithstanding the naysayers who disparage such heretical thoughts.They remind me of Chamas who claim victory over Israel in Gaza disregarding all evidence otherwise. I've followed this conversation for a while. I didn't go to the levaya if for no other reason than because I was sick in bed. Igrew up on Brighton and at one time or another davened in most of the shuls/shtibelach there were around some 20 odd years ago.Rabbi Hollander was instrumental in F.R.E.E. getting the larger ( main ) biulding for $1 lease, for IIRC, 20 years.At the time the membership of his shul was quiet small, though they continued having daily minyonim in the smaller building.A couple of years ago the whole property was transfered to F.R.E.E. He davened there every day. He gave a drosho on Yom Kippur in yiddish for the huuge crowd of Russ. Immigrants ( though I remember this from my days, don't know if and when he stopped.) He's seen the picture of the Rebbe in his shul for as long as it's been there and that's a while. I'm not crazy about tzig's king Kong-like chest banging, but I would say that he a hadras kovod and ibergebenkeit to the Rebbe and the people who represented him on Brighton Beach. I think its wrong to use the occassion of the petira of rabbi Hollander to discuss several perceived faults in the Lubavitch movement. Some of these complaints are in my opinion very legitimate and undermine the reputation of Lubavitch in the Orthodox Synagogue world and that is the new campaign of lubavitch to parachute their people in all sorts of older shul and claim baalus. Perhaps we could have a separate discussion about this issue.And it is a pressing issue especially in the NY Metro region. Rabbi Hollander's glory days as a jewish leader was in the period of 1950-1975. In those days the chief leaders of orthodoxy here were the Rav, the Luabvitcher Rebbe and R.Feinstein. Next in line stood rabbi Kotler and Rabbi Henkin. As such r. Hollander viewed the Rebbe as a leader of orthodoxy. A glance at jewish publications from that era reveals the truth of what I write. . Holander did not keep up with the New paths of Lubavitch - personality Cult, messianism, hegemony over jewish life and the Post Rebbe era. To him Lubavitch was the time and place in the 1950s-1960's. Halevai it never changed ! דאס איז נישט בלויז מיין אייגענער מיינונג, נאר אויך די מיינונג פון די מענטשן מיט וועמען איך האב גערעדט ביי די לוי'. I'm with Schneur (in part) on this one . . . now is not the time. What happened with Rabbi Hollander is classic modus operandi of Lubab inc.They are always there, especially when they can gain more power, take over shuls and garner what they consider "respect for Lubavitch"
I think that Lubab had already taken the shul over before Rabbi Hollander passed away. The problem is that nobody else cares, nobody else was there for Rabbi Hollander and so many other rabbonim and askonim.Lubavitch have always known that every person needs to be acknowledged, given attention and they use it to their advantage. I''ll give you an example that I know personally:A chasidishe fellow (chasidish meanS what Lubab derogatively refer to as Chagas chasidim)who is very bright, good sense of humour, very good at saying "glaich vertlach", however this fellow, has many personal problems,does not learn anymore, not serious about parnusseh, bekitzer. empty and a bit of a tragedy.His own chassidus are sick of his vertlach and laziness and need of financial help.Time for the Lubab entry! Here every "Poylishe" looking chused gets kovod, because even Lubavitchers understand that brown shoes, t shirt,jeans, no peyos and long hair is not very Jewish and kol shekain chasidish looking, even if this shaliach wears a gartel,so "Peylishe" perceived as the real mccoys coming to Lubab is good. Anyway this guy gets his weekly dose of kuved as is tsefreeden, and Lubab bareemenzech, with a loser, abi he has accepted malchus. You bring in Rabbi Hirschprung . . . Here we go. Rabbi Hirschprung was a Rosh Yeshivah in the Lubavitcher Yeshivah in Montreal. Let us not forget his "invitation" to the siyum hashas in nun-zayin (Agav - when asked to comment about his lack of invitation, he said that they wouldn't have invited R' Meir Schapiro today as well). While not all of his children are close to Chabad, some of them do visit the Ohel etc. There is a trend here - casting out Choshuve Yidden that have a shaychus to Chabad, then complaining that we've hijacked there memory once it becomes apparent that you guys have done nothing to honor them. The Algemeiner has a fine writeup on Rav Hollander zatzal. It reports that he told a newspaperman that kimat a day doesn't pass that he doesn't speak to the Rebbe (SATMAR, the Divrei Yoel). So if he spoke to the Satmar Rebbe kimat every day, but went to the Lubavitcher only once in a while, what does that say? I also heard that Rav Hollander was once a guest of honor at a Satmarer dinner. That also says something. Rav Hollander and the Satmar Rebbe were both Ungarisher, so not surprising if they were closer to each other than Rav Hollander and the Lubavitcher Rebbe. Driving the hearse of litvaks has been an old cruel, and cowardly trick that the Lubes have been doing for years. They are "cleansing" the neshama that never really saw the light. A couple of years ago I was at a levaya in the of a Litvak that lived in Crown Heights for many years, and had either few or no kids. He did not look at Lubavitch in a favourble way, and he had said this publicly many a time. But he lived not far from the "Bais Hamikdash ShebiBavel", and he davened maariv there maybe 3 times in the 1960's when there was a snow storm or something like that. So of course you had the Chabadsker 'do gooders' come to the levaya to save his soul before it was too late and his poor body would be laid to rest. They said they were gonna take the hearse past 770. The few litvaks that were there tried to put up a fight. It looked like there was gonna be a fist fight. If Im not mistaken the poor guys daughter or niece was begging them not to digrace the niftar with all the idol worshiping nonsense. We all know the rest of the story... theres no way to beat a robot. There once lived an old Lubavitcher Chossid in Baltimore. He never liked the Litvaks there, he maybe davened in their shul once in 80 years, he would rather daven alone than in their Gayveh'dike minyonim,but they would harass him and call him names, just because he was a Lubavitcher Chossid. When he would travel to the Rebbe in New York they would steal his things and pull his beard. Those nasty snags were always up to their dirty snaggy tricks, even though this chossid had mesirus nefesh for kashrus while they stuffed their sorry faces with Hershey bars and Entenmann's cakes and while their daughters would go mixed swimming his daughters would sit at home and learn chassidus with their father. He stayed in Baltimore only because the Rebbe told him to stay, promising him that this place was his shlichus. Their Rosh Yeshivah would egg them on, promising them Olam HaBoh since they're doing G-d's work by harassing the Lubavitcher. When he was niftar his children wanted to take him to New York, and wanted a levaya KeMinhag HaChassidim, but those nasty snags blocked the way and forced him to endure a wailing maspid who was the ringleader of the ones who would make his life a living h-ll crying as if his own father had died. That phony darshan had no pride. This is the way of the snags. The only way they know. They force their self-worship onto others. G-d save us from them! First of all, Rav Pam's Aron also passed 770. Emese Yidden understand Emes and Davka wanted this Zchus before embarking to the Olam Haemes. שעפטל - I love it! "Emese Yidden understand Emes and Davka wanted this Zchus before embarking to the Olam Haemes." "When he would travel to the Rebbe in New York they would steal his things and pull his beard"
This is not a nice thing to say about the fine yidden of Baltimore. I can not believe that that all that they would to that Shliach/missionary was only pull his beard a steal his "things". (BTW, "things"? I wonder what type of things you mean, uhum. If I recall, Rachel Imeinu stole her fathers "things" too). In my neck of the woods this lube would have been running for dear life back to CH with his "things", beard, and mashiach stickers as fast as his bumper sticker car can go (not TOO fast, you dont want that menorah to fall off). No question, the guy would probably go psycho from the trauma, although its hard to imagine he wasnt psycho when he came to town. "his daughters would sit at home and learn chassidus with their father." Everyone reading this sentence is most definitely laughing their heads off. Lubavitch females are notorious for being "THE sluts" to put it mildly. I heard that they were thihking of making a law that one had to be 18 to enter CH. The rebbes wife opposed it. Well that definitely fits the profile! I'm sure you'd enjoy the following interview with Rav Hollander z"l.
I wasn't mashve if there's any "neias", but presumably a nice likkut "l'pundak echad". P.S. 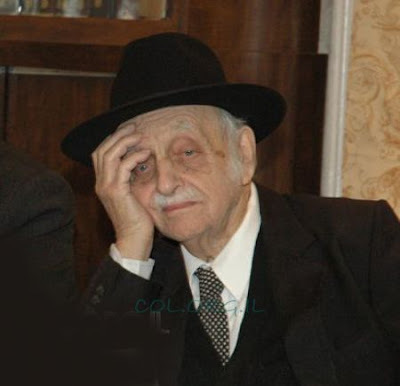 There are newly-released photos of HaRav M. Eliyahu's (zol zein gezunt!) bikur with the Rebbe ZY"A in 5752 there as well..
Rav Pams aron passed 770? are you sure? An association of Orthodox rabbis says it will issue a statement next week declaring that the Reform and Conservative movements are "not Judaism" and urging Jews not to attend synagogues affiliated with those movements. Reports of the group's plans prompted criticism from a wide spectrum of Jewish religious leaders. The president of the nation's largest Orthodox rabbinic organization described the development as "unfortunate." The association, the Union of Orthodox Rabbis in the United States and Canada, is to issue the statement on March 31, reflecting its long-held beliefs, said Rabbi Hersh Ginsberg of Brooklyn, its acting chairman. The association reports a membership of more than 500. Rabbi David Hollander, also of Brooklyn and a member of the association's executive board, said the statement was timed to counter efforts by Reform and Conservative leaders to gain official recognition for their movements in Israel. Referring to religious law, Rabbi Hollander said, "We're formulating a Halakhic ruling that will give the Parliament in Israel very strong, irrefutable arguments" against Reform and Conservative efforts. Although the Reform and Conservative movements make up the vast majority of religious Jews in the United States, their numbers are few in Israel, whose the population is divided between a secular majority and a large Orthodox minority. Israel's founders gave the Orthodox authority over religious affairs, including marriages, divorces and conversions. But in the early 1990's, the Israeli Supreme Court opened the door to a greater role for Reform and Conservative rabbis through a ruling suggesting that conversions in Israel by non-Orthodox rabbis could be legally recognized. The three Orthodox political parties in Prime Minister Benjamin Netanyahu's coalition Government are working to pass a bill that would reverse that ruling, an effort that has provoked an outcry from Reform and Conservative leaders. The plan by the Union of Orthodox Rabbis to issue its statement was reported on Saturday in The Los Angeles Times. Rabbi Hollander said the statement did not suggest that Jews in Reform and Conservative synagogues were any less Jewish than those in Orthodox synagogues. But he said they were being spiritually misled, "taught things contrary to the Torah." In his examples of heresy, Rabbi Hollander said religious law was violated by rabbis' allowing Jews to drive on the Sabbath, and by the Reform movement's 1983 decision to recognize as Jews the offspring of interfaith marriages in which either the father or mother was Jewish. Previously, all branches of Judiasm agreed that that Jewish identity was solely derived from the mother. Rabbi Rafael Grossman, the president of the Rabbinical Council of America, which represents more than 1,000 Orthodox rabbis and which is the nation's largest such group, said the statement represented the views of "a very distinct minority" among the Orthodox. "I would not associate with a statement that could or would cause the disenfranchisement of any segment of Jewry," Rabbi Grossman said. "We must never lose sight of our strong theological differences, but even more so, we must never lose sight of our strong bonding as Jews, as a people." Another well-known Orthodox figure, Rabbi Irving Greenberg, said the statement represented the beliefs of Orthodoxy's right-wing, whose influence has been growing at the expense of the "modern Orthodox" wing. So the statement is "ahead of itself," said Rabbi Greenberg, the president of the National Jewish Center for Learning and Leadership. "It does not represent the consensus of the whole community," he said. "I think it reflects the extremism that is growing." In general, he added, Orthodox Jews lack a theology that affirms a pluralistic view of religious Judaism. Leaders of the Reform and Conservative movements were sharply critical of the statement. Rabbi Eric Yoffie, the president of the Union of American Hebrew Congregations, which represents about 1,000 Reform synagogues, called it "terribly patronizing" and "desperate." "In a sense, it's not important," Rabbi Yoffie said, "because the Reform movement and the Conservatives don't look to someone else to confer legitimacy on us." Rabbi David L. Lieber, the president of the Rabbinical Assembly, which includes about 1,400 Conservative rabbis, called the statement "sheer chutzpah." "To the best that I can ascertain," Rabbi Lieber said, "this group is very much a fringe group, maybe not representing as much as 1 percent of American Jews." But Rabbi Hollander said: "We're not talking about a democratic vote. We're talking about religious law"." Pitting Jews against Jews, a faction of North American Orthodox rabbis is poised to declare that the two largest branches of American Judaism are not Jewish. The Union of Orthodox Rabbis hopes the proclamation will lure Jews away from the Reform and Conservative branches, which account for as much as 90% of U.S. Jews. "There are hundreds of thousands of Jews in America who are in Conservative or Reform movements. They are innocent. They are being misled," said Rabbi David Hollander, a leader of the 600-member Orthodox group, which says it is scheduled to make the formal declaration of its beliefs March 31 in New York. "They are being told they are being taught Judaism," Hollander said. "It's a deception of innocent Jews." The plan, which escalated a historic debate, triggered angry responses yesterday from Reform Jews in the city and across the country. They said the planned pronouncement itself is a violation of Jewish law. "The Orthodox definition of a Jew is anybody born to a Jewish mother, it's by blood, not by what you believe," said Aron Hirt-Manheimer, editor of Reform Judaism magazine, the official publication of the Union of American Hebrew Congregations, which represents 800 synagogues. "What they're doing is political, not religious," said Hirt-Manheimer. "It's against the law. They're breaking their own law, Jewish law." Said Rabbi Sanford Seltzer, a director of the Reform movement's Commission on Religious Living: "It becomes an act of desperation. It's divisive, it creates purposeless antagonism. In another age, they would have burned witches." Besides their differing views of what constitutes Jewish law, Orthodox and Reform Jews hold vastly different types of services. Orthodox rabbis conduct services in Hebrew and do not allow men to sit with women. Reform rabbis hold services in English and allow the sexes to mix. In their campaign to discredit Reform and Conservative Jews, the Union of Orthodox Rabbis is hoping to sway Israeli lawmakers into granting citizenship to only those who are converted to Judaism under Orthodox standards or whose mothers are Jewish. Israel's "Law of Return" stipulates that any Jew is eligible for Israeli citizenship. Orthodox members of the Israeli Parliament want their strict definition of who is a Jew codified into the law. Many Orthodox rabbis have long refused to recognize marriages, burials and conversions made by Reform and Conservative denominations. But no Orthodox rabbinical group has ever sought to negate another faction. "Those are fighting words," said Rabbi Alan Kalinsky, West Coast director of the moderate Union of Orthodox Jewish Congregations." -Yankle -You're obviously a sick individual with serious issues of hate - and perhaps a womanizer to boot. Get help man. Once the pills kick in, then perhaps you should consider commenting again. If I were you I would watch what you say about that pinnacle of ahavas Yisroel and gentleness,Maran mBnai Berak.As a result a fatwah was declared against me for desecrating the name of their so called "godol hador".I am the Solomon Rushdie of the blogs and have been excommunicated to the far reaches of Hades.LOL. "I remember the abuse that the Chabad families had to suffer from the holy benai torah,"
The only thing I can say is, I wish I was there to enjoy it too. Correction my above post was directed to anonymous 3:17:00 PM. "The only thing I can say is, I wish I was there to enjoy it too." The only thing I can say is, one can see where you got your apparent "ahavas Yisroel" from, the illustrious "Oihaiv Yishmoel mBnai Brak". i would like to mention one point, the last few years rabbi hollander had difficulty walking to and from shul, Rabbi Okonov made sure that he had a lift to shul twice daily!! where was anyone else the last few weeks when he was hospitalized? Rabbi okonov was there multiple times daily to make sure that thing were taken care of to Rabbi Hollander's liking and that he was comfortable. i didn't see anyone else running to help him and be there for him on a constant basis other than chabad! and while i wouldn't consider him a chossid, he definitely did treasure and value his relationship with the Rebbe and chabad in general. Arthur said:"one can see where you got your apparent "ahavas Yisroel" from, the illustrious "Oihaiv Yishmoel mBnai Brak"." HT, Please! How do you allow these immature, juvenile, petty coments on your site. It makes it so unpleasant for those of us that want to enjoy some stimulating debate (post elementry school). The answer to the 5th grade Arthur kid is, that Rav Schach was a "'SONEI' Yishmael"! Du bist ah Chusid vi ich bin Napoleon. Apparently a reply to someone who says that he revels in the abuse and suffering meted out to Lubavitcher Chassidim because of the rantings of maran mBnaiBrak is considered "immature, juvenile, petty " and "It makes it so unpleasant for those of us that want to enjoy some stimulating debate (post elementry school" the type of "stimulating debate"
your referring to is Chabad bashing. As I once replied to one of your fellow " post elementry school intelligentsia" who exhibited the same "Ahavas Lubavitch",If you don't like it don't read it or you can choose to wallow in the "unpleasantness". Ich vais nit tzu der Rebbe hut nachas fun mir .Mistame nit.Ober di vos zenen mezalzel Chabad un der Rebbe,zicher geben nachas tzu Maran mBnai Brak. The claim that it was all done on the request of the Rebbetzin, may she be well, is a joke. You have an alte, tzubrochene almonoh, her husband just passed away after being ill for months, she herself has health issues, and being a woman she couldn't do much, so she 'agreed', to get it off her shoulders. Wow !